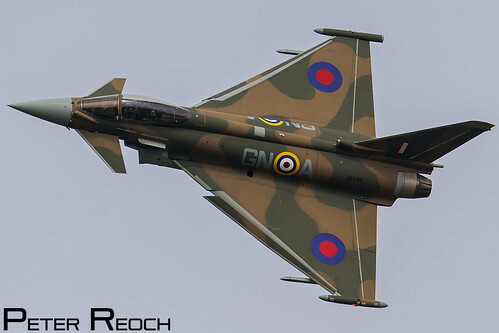 Resplendent in a new colour scheme, Eurofighter Typhoon FGR4 (ZK349) from 29(R) Squadron. Flying from RAF Coningsby, the jet is seen here performing infront of the Air Officer Commanding (AOC) 1 Group RAF, to be awarded Public Display Authorisation (PDA) for the 2015 air show season. The aircraft is painted in camouflage to represent a Hawker Hurricane from 249 Squadron during the Battle of Britain, specifically Flt Lt James Brindley Nicolson's aircraft - coded GN-A. The only Victoria Cross awarded to an RAF Fighter Command pilot during the Battle of Britain, was won by James Brindley Nicolson while serving with 249 squadron.